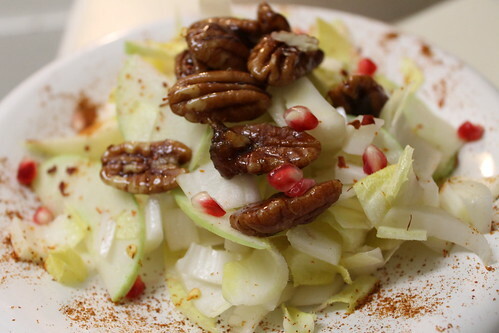 MoFo #2 — Apple & Endive Salad with Maple Pecans | Hot vegan chick.....peas! Happy Tuesday! It’s fall salad day and today’s recipe is from one of my favorite books, Veganomicon. I love this book so much that I’ve given it as gifts and make sure to carry it in my luggage on trips to see my parents. It’s got lots of omni-friendly comfort food recipes as well as fancy pants stuff that I like to save for special occasions. Mofo is a great time for me to try out some of the fancier recipes (like a salad that requires 45 min prep time! ), so last night I made pear & endive with maple candied pecans. Toasting and candying the pecans makes this salad a little time intensive, but boy is it worth it! I love candied pecans — we give them out every year as Christmas gifts and even take them on hiking or backpacking trips as a sweet and energy-packed snack. This was the first time I used maple syrup as the sugar source and it was really delicious. 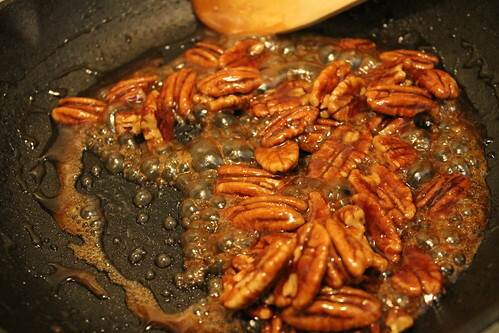 It was also way easier to keep the sugar from crystallizing on the pecans. Since Mr. Chickpea doesn’t like pears, I swapped them for apples. Then I realized I only had green apples and my pics would look really boring. I rooted around in the cabinets for something red, deciding on a pinch of red pepper flakes, smoked paprika, and some leftover pomegranate seeds. I think I’ll do this every time I make this recipe because wow — although I didn’t really taste the pomegranate, the smokiness and slight bitterness of paprika along with the kick from the chile flakes really made this salad delicious. I don’t know if I would use endive again — it’s hard to find and expensive ($2 per piece!!) and I think you could sub in chopped hearts of romaine and not miss a thing. I didn’t have white balsamic, which is recommended for the dressing, so I’d like to try a sweeter vinegar and see what it’s like. The red wine vinegar, which is what’s recommended as an alternate, was just ok. The sweetness of the pecans and fruit complemented everything so well, and it’s such a light dish and seems so fancy, that this is definitely in the running for my salad course this Thanksgiving! This is one thing out of V’con that I haven’t tried yet. And I’ve totally taken the book to my parents’ house too! I ended up just buying my mom a copy since she liked quite a few things out of it. I think I might buy them a copy, too! They really like the hummus recipe. wow, beautiful! I haven’t ever made this one. probably because where the hell do you find Endive?? I can’t believe Mr. Chickpea doesn’t like pears. That’s crazy. I’m on apple overload here – our tree has gone bonkers, so all apple things are looking good!